Weber Marking Systems of Canada Inc. It is tempting to think that life is a piece of cake for the owners and employees of King’s Pastry, a thriving fresh pastry and desserts manufacturer quickly earning itself a stellar reputation for the high quality and diverse range of delicious, authentically-made baked goods produced at the company’s 120,000-square-foot commercial bakery in Mississauga, Ont. But thinking so would do a disservice to that vast amount of hard work, continuous research and investment, artful culinary creativity, and cutting-edge technological savvy unfolding there on a daily basis. Key players in the bakery’s robotics integration project include (sitting from left) King’s Pastry operations manager Kelvin Tsang, co-owner Lewis Tsang and director of marketing Kevin Chan, joined by (standing from left) ABI communications director Aaron Burke and sales rep Tony Cacciola, and King’s Pastry engineering coordinating manager Ivy Jiang. 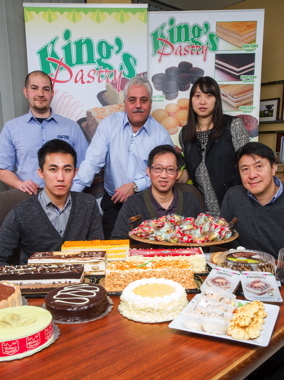 “We invest millions of dollars every year into new equipment at our facility to ensure continuous improvement in product quality and process efficiency,” says company co-owner Lewis Tsang, who founded King’s Pastry along with two business partners 19 years ago to produce a small variety of French-Oriental style cakes and pastries for local restaurants and bake shops. 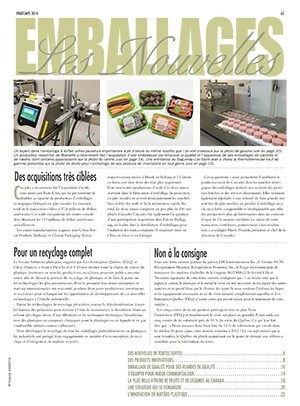 “We compete in a highly competitive marketplace with very thin profit margins, which makes cost control and lean production critical for our business,” Tsang told Canadian Packaging on a recent visit to the 200-employee production facility operating two shifts over a steady, five-days-a-week schedule throughout the year to produce a staggering array of cakes, desserts, cookies, tarts, rolls, puffs and other high-quality baked goods in an ever-growing range of serving sizes and packaging formats. Nowadays producing well over 200 different SKUs (stock-keeping units) at a single location for a steady-growing customer base in the foodservice and retail markets, the facility ships out over 2,000 full truckloads per year to leading foodservice distributors like Sysco; a multitude of restaurants, catering services, hotels, institutions and other foodservice operators; and to major Canadian supermarket chains such as Loblaws, Metro, Sobeys, Safeway, Costco and Walmart, among others. Installed and integrated by baking equipment and systems specialists at ABI Ltd, the ABB robotic workcell at the King’s Pastry state-of-the-art production facility a short drive west of Toronto in Mississauga has enabled the plant to achieve multiple production line efficiencies, along with significant reduction in manual labor costs and requirements. According to the bakery’s engineering coordinating manager Ivy Jiang, the company’s “exponential growth” of recent years stems directly from “our passion and dedication to producing quality products. “Our customers are continually impressed by the combination of the high quality of our products and the extremely competitive pricing that we offer for those products,” she says. “They are also often surprised to find the large variety of product categories—covering single-serve cakes, bite-sized desserts, bar cakes, coffee cakes, mousse cakes, etc.—that we manage to make all under one roof,” Jiang states. This diverse product variety is aptly underscored with the high-quality packaging used to ship its products. 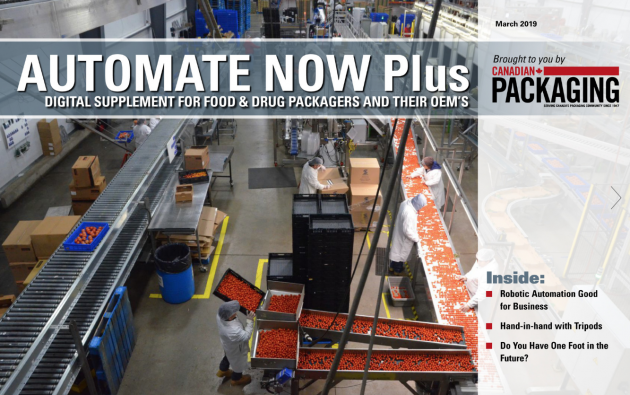 For bulk shipments, the plant makes extensive use of pre-printed corrugated cases supplied by the Norampac division of leading Canadian forest products group Cascades Inc. of Kingsey Falls, Que. 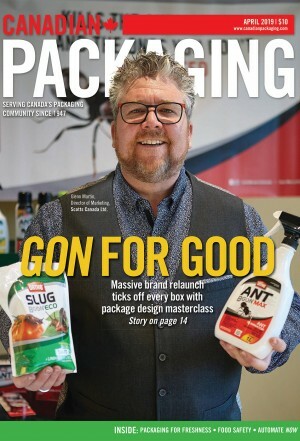 For retail customers such as grocery chains and drugstores, King’s Pastry uses a broad selection of shapes and sizes of rigid plastic clamshell packaging supplied by the Brampton, Ont.-based Pactiv Canada, Inc. Typically comprising a black plastic base and a clear-plastic, shape-fitting dome with built-in, snap-on closures to hold the two pieces in place throughout distribution, the fully-recyclable clamshell packaging offers terrific product protection and transparency that enables the eye-catching King’s Pastry creations—from round 750-gram coffee cakes and rectangular 800-gram layered bar cakes to the single-serve cakes and crispy puff pastries—virtually sell themselves on the shelf. 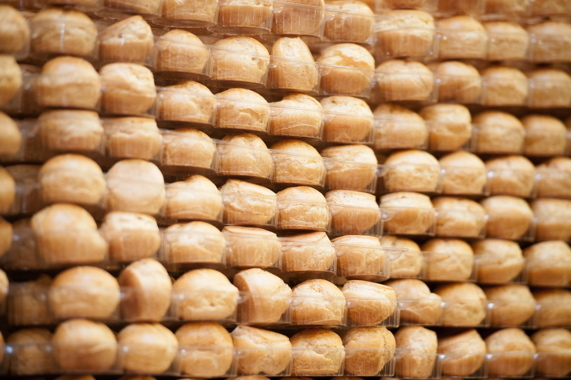 “Packaging plays a very important role in the retail pastry and dessert business,” Jiang states. “With the keen competition and limited shelf space, we have to make our product stand out,” says Jiang, citing the prevailing trend to the so-called ‘clean labeling’ of easily-recognizable ingredients as one of the more important recent developments in the baked-good industry. “The ongoing consumer trends toward healthier lifestyles and dietary habits are creating an opportunity for King’s Pastry to become both cleaner and greener,” Jiang reflects. With a fully-equipped on-site R&D lab dedicated to developing new recipes, flavor variations and formats to keep its foodservice and retail customers consistently coming back for more, the Mississauga facility is naturally a beehive of fast-paced activity. To keep up with its robust production volumes, the plant houses 14 different production lines, each specializing in a particular product line such as pastries, slab cakes, bar cakes, puffs, coffee cakes, retail cakes, etc., Jiang explains. 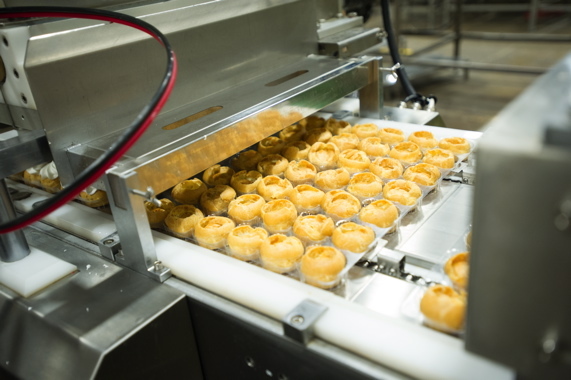 Comprising four high-speed ABB model FlexPicker IRB 340 pick-and-place robots outfitted with special soft-touch Festo grippers for gentle product handling, the workcell enables the plant to keep up with vast demand growth for its high-quality cream puffs. “Our production philosophy is based on finding the optimal balance between automation and manual labor in order to provide the best possible product quality, consistency and value to our customers,” Jiang states. 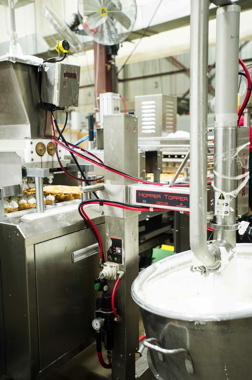 Naturally, the King’s Pastry also uses only the best raw ingredients it can get its hands on to get the production process rolling, which is done at the plant’s large-capacity, centralized Silo System. Manufactured by ABB Robotics and integrated at the King’s Pastry facility by ABI, the FlexPicker model IRB 640 robot can replicate more than 1,000 hand-drawn decorative patterns stored in its computer memory at speeds of up to 126 pieces per five seconds. Comprising five advanced subsystems—three for handling three types of flour and two for sugar—the Silo System produces all of the plant’s cake mixes and gelatin dessert mixes from scratch, reaching maximum monthly production capacity of 2,000 tonnes. With storage capacity of 100,000 kilograms, the Silo System goes through 50,000 kilos of sugar and 25,000 kilos of flour each week, enabling the plant to ship out an equivalent of 100 truck-trailer loads of dry-mix products monthly. 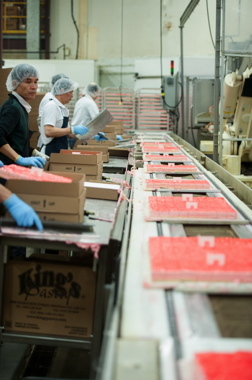 Line workers at the King’s Pastry plant in Mississauga placing trays of freshly decorated pre-cut pieces of moist and delicious raspberry layered mousse cake inside the Norampac corrugated boxes used for bulk product shipments to foodservice customers. The mixed batches of raw product are continuously fed through the plant’s two high-performance cyclo-thermic tunnel ovens—one catering to pastries and the other to cakes—to cook the mixed dough to desired texture and consistency levels. Measuring about 150 feet in length, each tunnel has a production capacity of about 140 truck-trailer loads—equaling to 630,000 trays of product—per month. While foodservice customers currently account for about 60 per cent of the company’s total output, King’s Pastry is determined to grow the retail part of its business at a quick pace in the months and years ahead, Jiang relates. The Golden Blends range of gelatin dessert, pudding, cake and other mixes for the DIY home chefs. 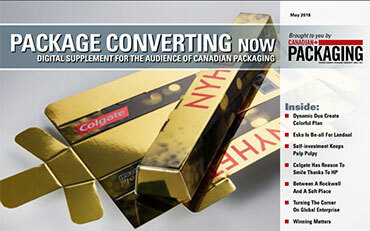 To boost the packaging throughput levels for some of the company’s bestselling, fast-moving products such as bite-sized cream puffs and jelly-filled round and long puffs and éclairs, King’s Pastry recently turned to one of its trusted technology suppliers, Concord, Ont.-based system integrators ABI Ltd., to provide a high-speed, fully-automated solution for placing the delicate pastries inside the pre-formed, clear-plastic clamshell trays in several rows of product at a time. “ABI has provided us with state-of-the-art production capabilities that are instrumental in our ability to deliver consistently high-quality finished products, even as the demand for our products grows rapidly,” Jiang relates. 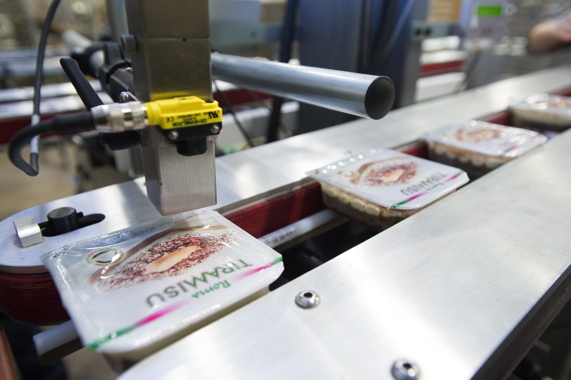 After being packed into the plastic clamshell tray bottoms by the ABB pick-and-place robots, the freshly made rolls are pierced from the top and filled with whipped cream just prior to lidding. 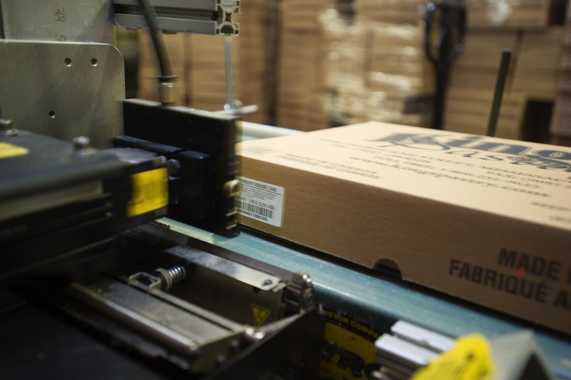 All the products made at the King’s Pastry facility go through one of several Loma Systems model IQ3 metal detectors as part of the plant’s rigorous quality control and assurance regimen. 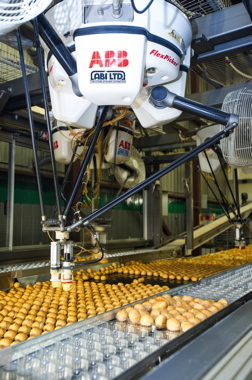 The full-enclosed robotic cell designed and integrated by ABI employs four high-performance FlexPicker IRB 340 pick-and-place robots—manufactured by ABB Robotics—to perform the highly-repetitive task of gently picking up the individual puffs and placing them into their proper cavity inside the trays at a blink of an eye. 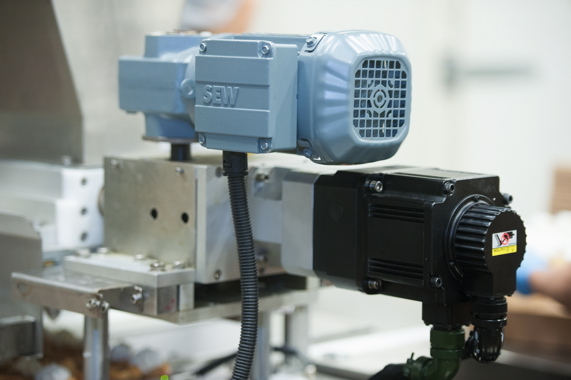 With each robot outfitted with robust Cognex machine vision system for optimal accuracy and repeatability, the low-noise robotic cell virtually runs itself, according to Jiang, in what is for the most part an error-free process. “We used to have a lot of people taking up a lot of room on the production line manually loading the rolls into those trays,” recalls Jiang. 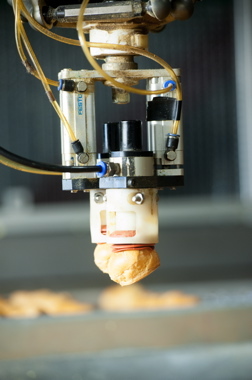 “It was a very labor-intensive operation that took up a fair bit of time and also resulted in some quality control issues that you always encounter with so much manual product handling,” says Jiang, praising the robots’ specially-designed grippers for ensuring supremely gentle product handling throughout the process. 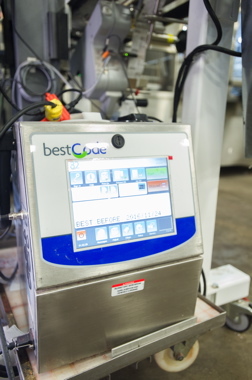 Originally developed for the U.S. private-label market, the Tiramisu refrigerated cakes have their best-before dates applied by one of two high-speed BestCode inkjet coders (see below) supplied to the bakery by Weber Marking Systems. 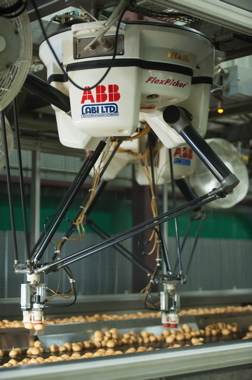 Designed for optimal operational flexibility in a compact footprint, each of the four high-precision, four-axis FlexPicker IRB 360 robots can perform up to 150 picks per minute, with their advanced IRC5 controller helping to ensure the highest speed and path-following accuracy to track fast-moving products. In addition, the FlexPicker IRB340 models installed at King’s Pastry feature washdown-ready construction with special water-repellent paint finish, corrosion-resistant material surfaces, and fully-sealed components for easy cleaning and maintenance. This is of particular importance to the Mississauga facility, which works hard to annually renew its hard-earned SQF (Safe Quality Food) and HACCP (Hazard analysis Critical Control Points) certifications. “We must always strive to ensure that our food is perfectly safe and is of excellent quality,” Jiang states. 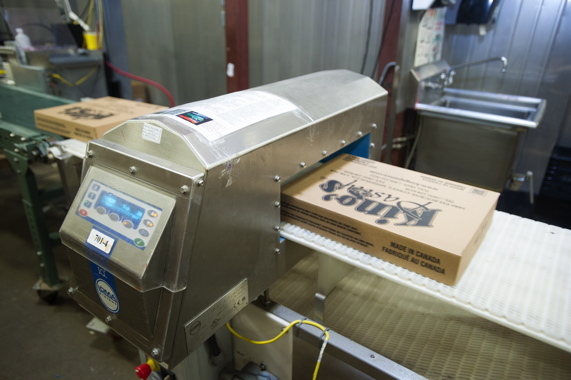 “We are audited by food safety auditors for globally-recognized SQF accreditation, one of the highest standards in this industry, on a yearly basis. “More recently, we voluntarily added the Costco food safety audit on top of the main SQF audit and achieved a perfect score,” Jiang reveals. 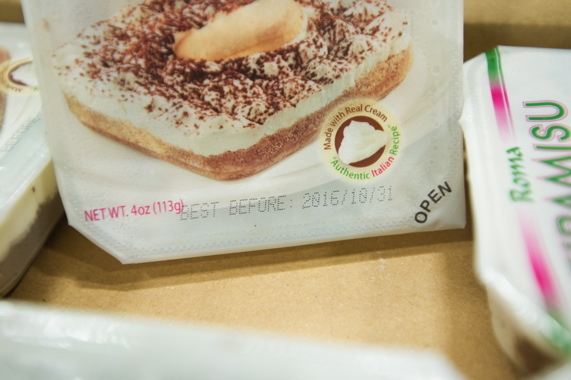 Sealed trays of single-serve Tiramisu cakes pass by a BestCode inkjet coding system for high=speed application of best-before dates and other key variable product information. 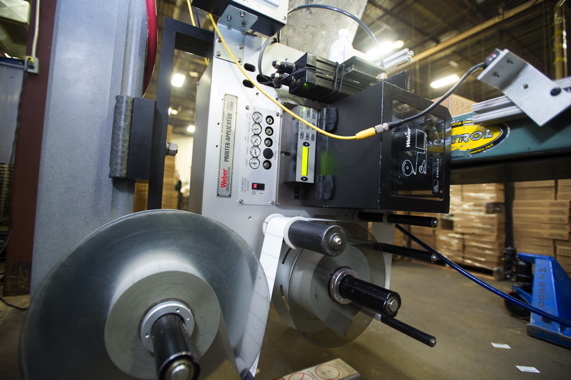 A roll of pressure-sensitive labels processed by a high-speed printer-applicator from Weber for precise application of individual labels onto the corrugated shipping boxes. 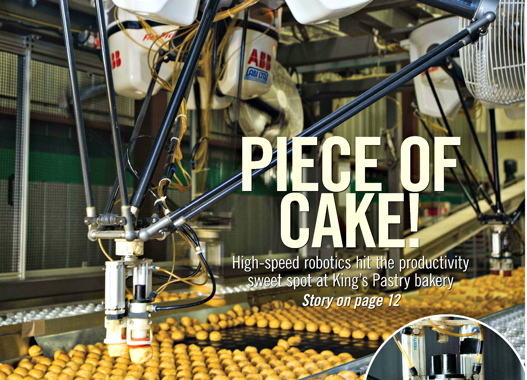 In addition to the pick-and-place robots, ABI also supplied the King’s Pastry plant with a custom-engineered, computerized cake decorating robot used to add finishing design touches onto the individual surfaces of the company’s multitude of mini-cake varieties—ranging from the dry-mix carrot and cappuccino cakes to the soft-textured coconut, mango and raspberry mousse cakes. Employing a custom-designed, 126-nozzle depositor connected to a touchscreen computer, the modified ABB-made FlexPicker 640 model robot can execute up to 1,000 different hand-drawn patterns stored in the computer’s memory—flawlessly recreating these patterns onto each individual mini-cake by applying just the perfect amount of chocolate and other icings/toppings at a rate of 126 pieces every five seconds. 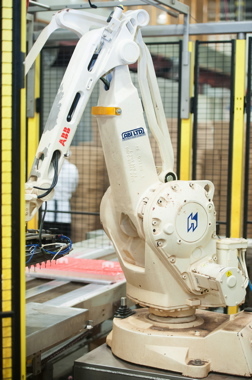 According to Jiang, the plant’s highly positive experience with robotics to date has prompted the management to allocate additional investment in robotic technologies for later this year, as robust demand growth from customers both in Canada and the U.S. is driving the need for installation of additional production lines. To help the plant meet all of its objectives, ABI is already hard at work on a new project involving high-tech mixing of icing and batters, as well as fully automating an existing complete product line at the plant. The high-speed printer-applicator from Weber Marking Systems applying individual product labels onto the front side panels of passing boxes with unfailing placement accuracy. With ABI sales representative Tony Cacciola leading a dedicated team of expert staff mechanical and electrical engineers through all the rigorous testing and R&D procedures, it’s a safe bet that the final project will meet all of King’s Pastry’s high expectations. In fact, meeting and exceeding customer expectations on a consistent basis is ABI’s signature calling card, according to Cacciola. Founded about 30 years ago by Alex and Mike Kuperman, who selected the company names as verbal shorthand for “Auto Bake Industries,” ABI started out by focusing on bagel and bread manufacturing equipment, Cacciola relates, but has since expanded its skillset and knowledge base to include packaging, palletizing and many other key related processes in the value chain. 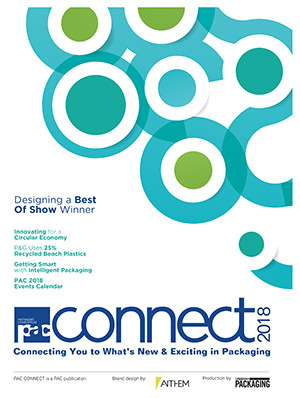 The pre-printed corrugated shipping container made by the Norampac division of Cascades Inc. provide superior product protection and stability for bulk product shipments. 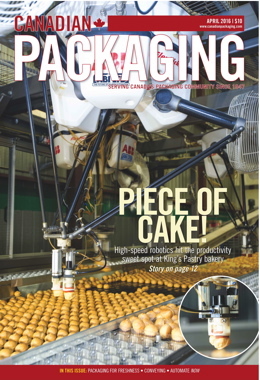 “Once the new processing workflow at King’s Pastry is perfected, then the automation of the packaging portion of the project will follow soon,” Cacciola states. “Our partnership with King’s Pastry is a long-term relationship that often requires patience in the planning stages,” he says, “and we’re fortunate to have an understanding client who really appreciates the value of getting everything right from the outset. “We love working together with a company whose progressive mindset matches our own,” Cacciola points out. 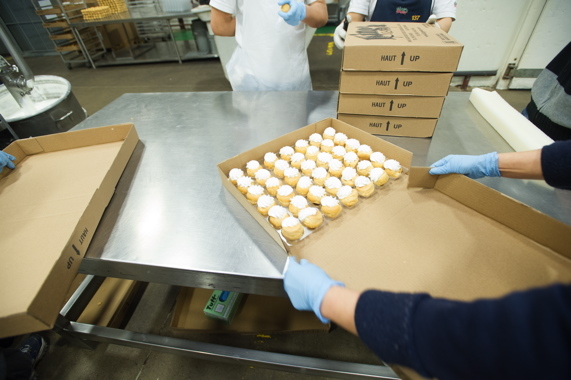 “Our facility is continuously being upgraded at all times in an effort to remain on the cutting edge of food production technology,” concurs King’s Pastry’s Jiang. “Our core strength lies in being able to make our mass production process incorporate high efficiencies that save us time and labor costs, thereby enabling us to pass on those savings to our customers,” Jiang explains. “These efficiencies are a direct result of our heavy investment in automation and the continuous improvement achieved by reengineering our production processes and workflow on a yearly basis,” she points out. 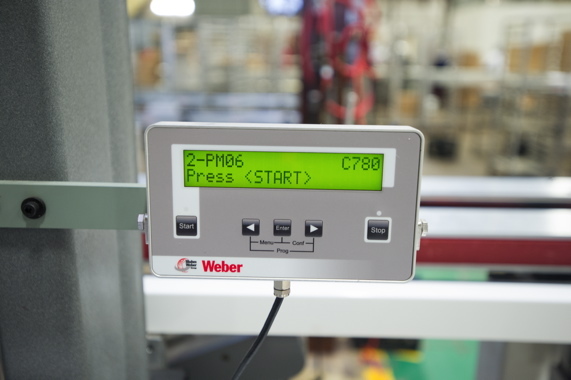 A touchscreen operator control panel for the high-speed Weber print-and-apply labeling system enables user-friendly operation and fast product changeovers at the busy plant. Says Jiang: “With industry-leading partners such as ABI and ABB Robotics, as well as other companies through which we source equipment, ingredients and materials, we believe we are poised to continue growing and improving our operations well into the future. “The quality of the equipment that both companies have provided has been excellent,” Jiang concludes, “while the service levels and technical assistance they provide are on par with what one would expect from companies that are both leaders in their field, servicing industrial-scale clients across the globe. The King’s Pastry production facility employs a large number of SEW-Eurodrive motors to help maintain optimal performance and reliability of the plant’s many conveyor lines.